Our girls love banana bread and they love French toast—but, they especially love French toast sticks made from banana bread. The stick version of the popular breakfast dish is designed for kids. French toast sticks are “dip” ready, they are easy to eat—and mom doesn’t need to cut them up. These French toast sticks take a common recipe—and give it a twist. We swap the usual French bread with home baked banana bread—and cut the bread into strips or sticks for kid friendly eating. Prepare the egg mixture. In a shallow pan or bowl, combine the eggs, milk, sugar, salt, cinnamon and allspice. Mix thoroughly with a whisk. Preheat the grill pan. I use a heavy grill pan—but, a griddle or even a skillet work well. Melt the butter in the pan. Dip and fry the Banana Bread French Toast Sticks. 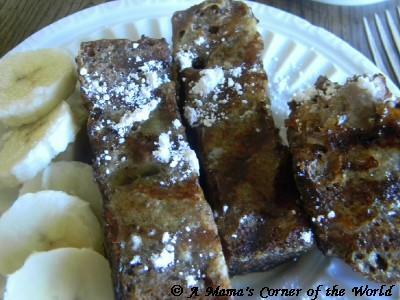 Dip each banana bread French toast stick into the egg mixture. Turn to coat both sides. Place sticks onto preheated grill pan and fry on each side until golden brown. Usually 2-4 minutes per side. Serve. Sometimes we lightly dust the sticks with powdered sugar and serve with fresh banana slices and maple syrup—like traditional French toast. Other times the girls simply dip the French toast sticks into bowls or cups of syrup. Why have I never tried making French toast with the leftover banana bread? This sounds totally yummy!